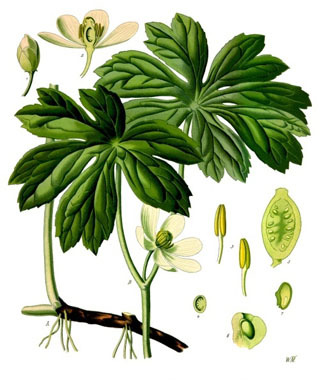 The mayapple is a perennial plant that is in the Berberidaceae (barberry) family. 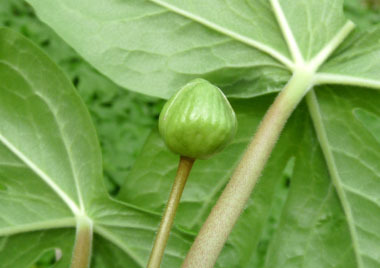 Mayapple is unique in that it has only two umbrella-like leaves and one flower once fully mature. (In its immature stage it has only one leaf and no flower.) 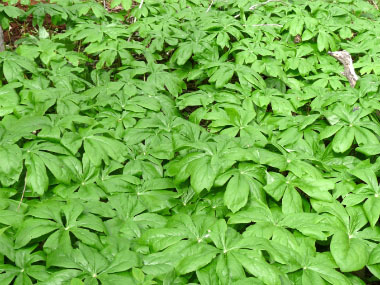 Mayapple colonizes by rhizomes forming dense mats making this an easy plant to spot from a distance. Many gardeners have transplanted this to their gardens but it will only survive in moist, humus-rich soils. It is even drought-tolerant within its eastern forest range. Distinguishing Features: This springtime plant can be easily spotted by its large deeply cut leaves. 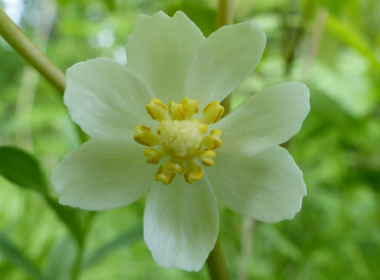 Look under the leaves and there is one large white flower which transforms into one yellow fruit. 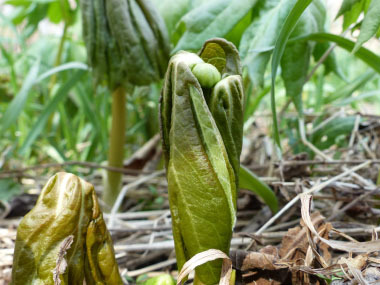 The mayapple is one of the first plants to emerge from the ground in early spring. 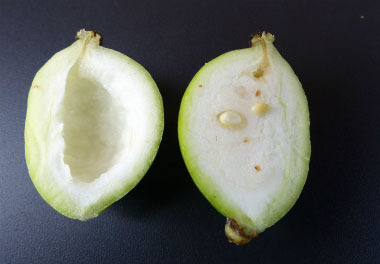 The flower appears in May but the fruit does not appear and ripen until later in the summer (typically July). Flowers: The solitary, nodding, white to rose-coloured flower grows in the axil of the leaves and has 6 to 9 waxy white petals. A large greenish-yellow ovary is surrounded by well over a dozen yellow stamens. The stigma is a mealy growth at the tip of the ovary. 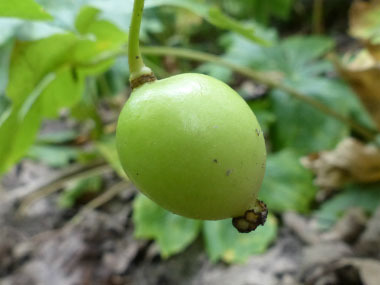 The fruit appears after flowering; it enlarges and turns yellow when ripe in early summer. 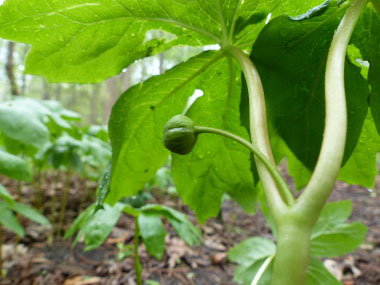 Fields of Nutrition has medicinal benefits and vitamin/mineral content of Mayapple. 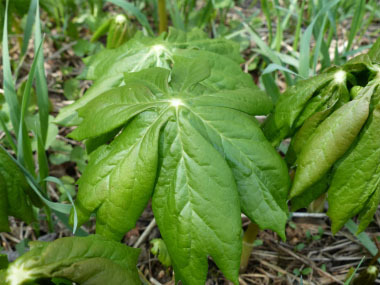 Leaves: The large, twin, umbrella-like leaves of the mayapple are showy and conspicuous. They remain closed as the stem lengthens, then unfolding 15 to cm (6-8”) across once the plant has reached its full height. Each palmate leaf has 5 to 9 lobes. The leaves continue to grow after flowering and can reach up to 40 cm (16”) across. The leaves are bright green, but after flowering they become covered with yellow spots. By mid summer, the entire leaf yellows and returns to the soil. Height: Mayapples grow 30 to 45 cm (11-17 “) tall. The stem is smooth, stout, and hairless. 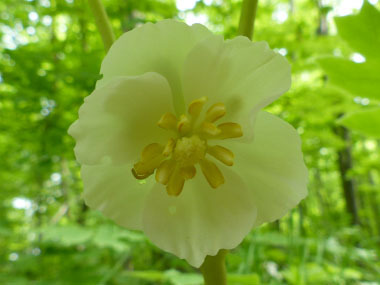 Habitat: Mayapple grows in colonies preferring shaded areas with soil that is damp in locations such as hillside seeps, meadows, and open woodlands. They have even been seen along roadsides. Mayapples can be found in Canada from Ontario to the Maritime provinces, and in the eastern part of the United States extending inland as far as Kansas, Oklahoma, Iowa and Texas. This plant is a cash crop in parts of Europe and in Russia. 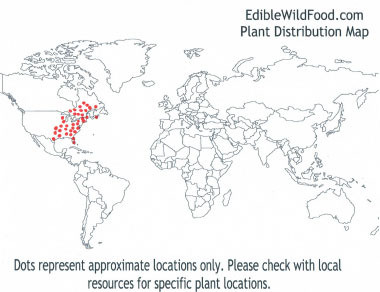 Edible parts: Only the ripened yellow fruit is edible and the seeds must be removed!. The fruit is tasty but you MUST be sure it is ripe before ingesting it! If it is green or even greenish-yellow do not eat! The fruit can be used in fruit smoothies and in jellies.